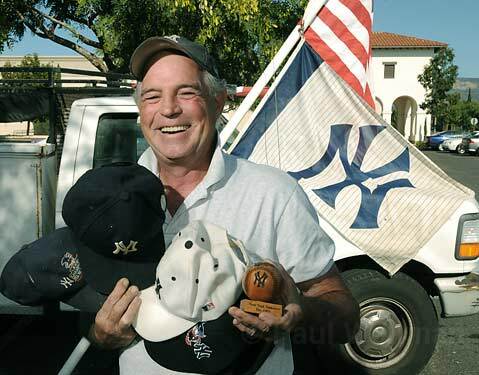 Carpinteria's Bill Connell shows his Yankee pride with five caps and a souvenir wooden baseball. 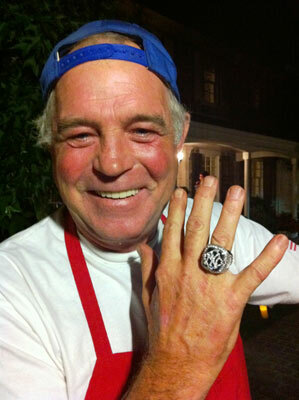 Not only were Connell’s hot dogs a hit with the crowd—to the bewilderment of the gourmet chefs at the party—but Jacobs, impressed by the vendor’s evident passion for baseball, gave him temporary custody of a genuine 2009 World Series championship ring, encrusted with 119 diamonds. Only a couple days later, Connell hit the trifecta—another memorable trip to Dodger Stadium. This time, he took 50 people with him on a chartered bus from his Surf Dog stand in Carpinteria. We expected to see a low-scoring duel between two of the game’s best young pitchers, Tim Lincecum of the Giants and Clayton Kershaw of the Dodgers. Instead, we were treated to an evening of wacky incidents that stoked up the L.A.-San Francisco rivalry. Much to our surprise, the Dodgers got to Lincecum for five runs in the first three innings. Kershaw was in command until the fifth inning, when the Giants got a break, thanks to Xavier being Manny—rookie Xavier Paul, subbing for the injured Manny Ramirez (more slug than slugger these days) in left field, had a flyball drop out of his glove. Three runs later, the Giants trailed just 5-4. In the bottom of the fifth, after brushing back Matt Kemp with a pitch, Lincecum nailed him with another. A smattering of boos was directed at the Giants hurler. When relief pitcher Denny Bautista threw a fastball under the chin of L.A.’s Russell Martin in the sixth inning, the natives grew even more restless. They rose to their feet—almost a third of them to boo, the rest to get more beer. The home plate umpire took offense to an animated scolding by Bob Schaefer, the Dodgers’ bench coach, and ejected him. I could not understand why people were leaving the stadium in droves. I guess they got what they came for—a James Loney bobblehead—but they missed a deliciously bizarre scene in the ninth inning. A few spectators were confounded during the ninth-inning comedy of errors. It occurred to me that in years past, we would have heard Vin Scully describing the incident via hand-held radios throughout the stadium. But now the iconic announcer spends most of his time on television. The next best thing to being at a game is hearing Scully talk about it. If the late Bob Sheppard, longtime public address announcer for the Yankees, was the “Voice of God,” then Scully is the “Voice of the Seraph.” He’ll have plenty to say this weekend when the Dodgers and Giants resume their hostilities in San Francisco. GAME OF THE WEEK: The Santa Barbara Foresters will be packing up for the NBC World Series in Wichita after playing their last home game of the season versus the Santa Maria Packers, 5 p.m. Saturday, July 31, at the UCSB diamond.